It’s been awhile since I last reviewed one of Grave Tone Productions’ albums, so let’s catch up on their releases. 2015 saw the release of their kid-friendly single “Jack the Jack O’ Lantern” and the debut of their short film Who’s There? on YouTube. 2016 brought us Found Remains: Songs from the Grave and now we have the subject of today’s review! The opening track, “Home Is Where the Horror Is,” starts with a message warning about the album’s content. This is soon followed by another warning in Spanish! Low synths, spooky strings and snippets of piano then guitars take over. I realized this was going to be more “rock” than “ambience” once the speedy drums joined in. But it is admittedly very catchy and works as a standalone song. I especially enjoyed the guitar noodlings towards the end. Bursts of guitar open “Death Bed” and some piano work puts in a few brief appearances. There’s interesting use of a guitar and this time the rock feel is backed by eerily ethereal noises. A crackling record effect brings in some wordless female vocals, along with a woman saying a prayer in Spanish. But the guitars, piano and ethereal noises take things back. There’s also some nifty alternating drums and guitars and even the sound of breaking glass! If your haunted attraction has a room where a record player turns itself on, make sure to use this. You can even have one of your performers sneak up on guests as they’re distracted by the radio. “Murder House” is fairly soothing at first. But the soft piano work and strings are briefly interrupted by bursts of guitar work. The piano takes the spotlight for awhile but then guitars and percussion put in a more lasting appearance. Said guitars take on a reverby sound for a bit and the end result reminds me of the soundtrack to an old European horror movie. The guitar work is creepy even when the reverb stops. The creep factor increases once the sinister strings and elegant piano work take over for the ending. “Don’t Open the Door” uses guitars, drums and cymbals to grab the listener’s attention. The voice who warned us about the album’s content return to remark on how every life comes with a death sentence and the instruments take the track back to play us out. “Dying Within” has a somewhat Western feel to it at times. Perhaps the metallic noises it occasionally uses are meant to be spurs? The opening guitar work is slow and low key, but picks up with a reverby feel. Things take on a more rockin’ tone and eventually transitions into super speedy 80’s metal before the two styles are combined. I simply love the drum work and guitar variations. It takes on a steady, determined feel once the medium piano bursts and wordless unisex vocals kick in. There’s also some booming and militaristic drums for good measure. This is the perfect track for those looking to do something a little different with their haunt’s ghost town scene. In “Deathtime Story” a little boy asks if his father will read him a bedtime story. A xylophone plays as little girls sing “Ring Around the Rosie,” but this yields to slow, mournful circus music. The xylophone returns after a spell, only for buzzing guitars, clapping hands and a calliope join in. There’s plenty of high pitched electric feedback and some sneaking tones are heard every so often during the calliope segment. After we hear the melody symbolizing the “We all fall down” part of the classic nursery rhyme, an announcer tells us that all houses where men and women have died are haunted houses. A little girl is heard asking “Daddy where are you?” and children sing a menacing song asking people to come out and play. As if things weren’t eerie enough, a kid’s voice is heard in the distance! More clapping, buzzing and guitars are heard before the calliope returns. After some feedback and sounds of children playing, the little boy from the beginning says goodnight to his father. I couldn’t help but come out of this thinking of evil spirits trying to lure the unsuspecting into an eternal game of Hide and Seek. This can be done in your haunt by playing this as visitors enter an area decorated to look like an empty child’s room. Toys and other items could move by themselves when the kids are heard to suggest their presence. Then a spectral child materializes and appears to be facing a wall to count down while the others hide. As said child starts to fade away, their head suddenly spins around to reveal a terrifying face! This can be accomplished by making a motorized version of “Creepy Shelly” set up with a Pepper’s Ghost effect. “Panic Room” has plenty of guitars and interesting percussion. There’s some unearthly music in back at times as well. “No Way Out” features incredibly fast marching drums and heavy guitars. A spooky voice warns us there’s no way out and we later hear what appears to be a sample about punishment of Biblical proportions. The track even ends with the sound of an explosion! I could definitely see this working in an escape room. “It Was Only a Nightmare” combines extremely creepy synthesizer tones with string work and piano. Drums slowly come in, as do guitars. A slow acoustic guitar suddenly takes over, only for the other instruments and eerie stuff to find their way in. But if the guitar was your favorite part, you will be pleased to learn that it comes back for a soft solo performance at the end. 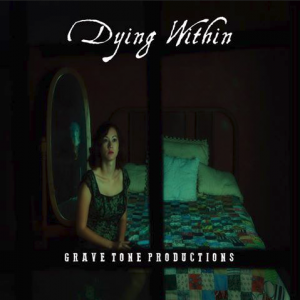 Dying Within is an interesting haunt soundtrack which I personally feel is better suited for entertaining people waiting to get into a haunted attraction (or for people coming to your door on Halloween) rather than using it in the haunt itself. But as I noted earlier, there are some exceptions to this and in the end it all depends on your own personal preferences for haunt audio. I can also see haunted attractions located in areas with large Spanish-speaking populations being especially interested in this release. Scary music albums featuring spoken word segments usually focus on a single language and its nice to have one with something for everyone. It’s also a wonderful listening experience which can be enjoyed throughout the year. So don’t be afraid to check it out even if you prefer orchestral material for haunting! Special thanks to Grave Tone Productions for the review copy!